Something rather exciting came out of the Craft Fair on the weekend that I’d like to share with you all. The bath products sold really, really well. 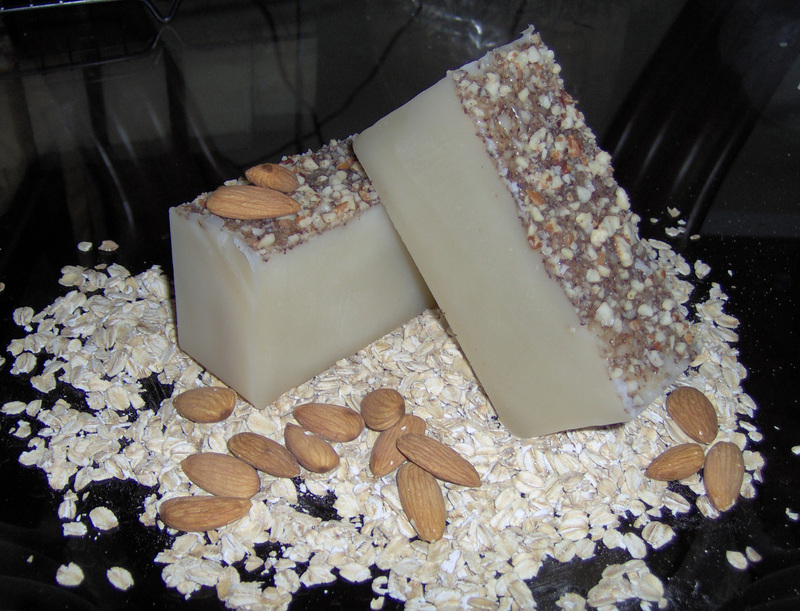 In fact, I totally sold out of my favorite soap, the Almond Oatcake. This didn’t really surprise me and I’m going to make a fresh batch this weekend as well as order at least a quart of this fragrance. It’s sooooo nummy. Part of the reason I make soap is I really love the organic feel of the process. There’s something downright magical about watching a bunch of oil emulsify with the lye solution and swirl itself into soap. I love that it’s old-fashioned, the way they did things “back in the day”. The really exciting thing is that I was approached by Tammy, the Manager of the Creston Museum and she asked me if I was interested in putting my soap line and jewelry into the gift shop at the museum. I have to tell you, saying yes to this great opportunity is a no-brainer for me. I’m honoured to be asked and, quite frankly, really excited about tailoring part of the soap line to the Museum itself. I’m thinking antiqued papers, sepia tones, elegant fonts. Lovely brown bottles. Apothecary-style. If you haven’t checked out the Creston Museum yet, you really should. We often overlook great resources like this when they’re in our back yard. Pay them a visit and experience a bit of the history of your very own town. You can visit the website here: Creston Museum. Have a look and see what they’re all about! I don’t know whether I’m excited to see if anything sells or if I’m just looking forward to Sunday and it all being over. It’s Craft Fair!!! 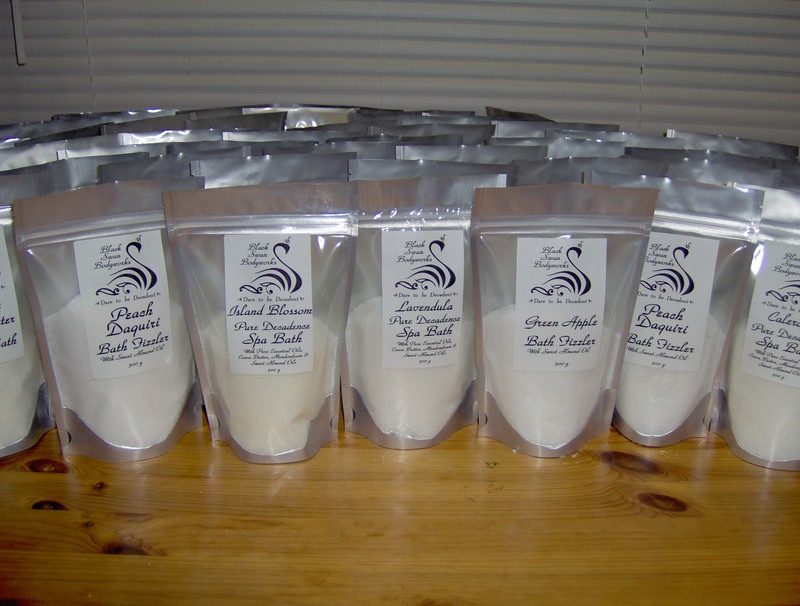 It took forever, but the bath salts are packaged. 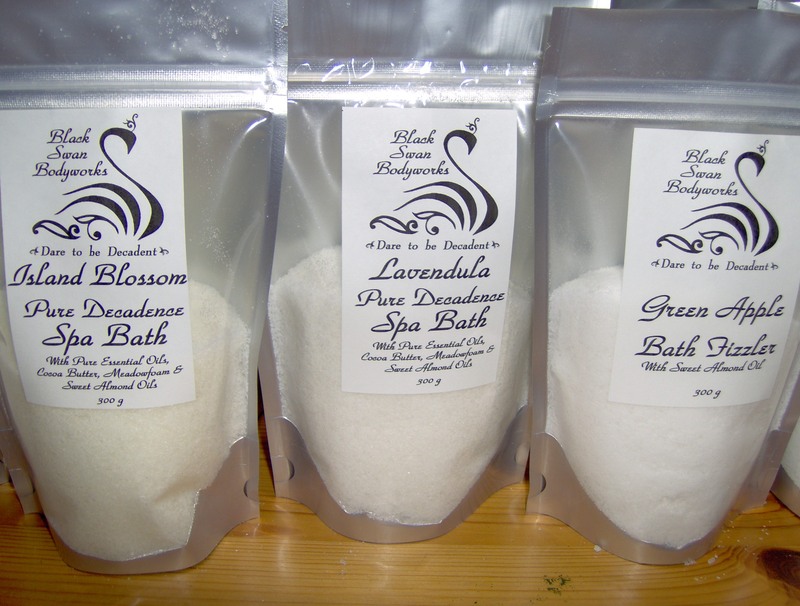 There’s Spa Bath with Pure Essential Oils, Cocoa Butter, Meadowfoam & Sweet Almond Oils, Bath Fizzlers with the fresh scents of Green Apples or Peach Daquiris, Cocoa Butter & Honey Bath….and the list goes on. I love being creative. I love taking a bunch of different things and producing something new and wonderful. Something that would not exist if not for my intervention. Whether it be yummy soap or a fabulous new piece of jewelry, their very existence makes me happy. I’m happy to say “I did that.” Strangely enough, though, when it comes to SELLING what I’ve made I turn into a bit of a turtle. I’ve been told I tend to under-value what I make. When someone says “How much?” I mumble some price that I’m usually thinking I have no business asking and that the person asking is thinking “Is that all?” I say this only because I’ve been told this. Repeatedly. I don’t know why it is, but it’s quite common for some artists to under-price their work. I think part of it is because many artists don’t make a living off their art and are just thrilled to sell something. I think the other part is more insidious. I think it’s a self-esteem issue. It’s almost as if some artists think, if even on only a subconscious level, that if they ask a higher price then they’re somehow guilty of hubris. They may fear that someone will actually gasp in horror and exclaim “You must be joking…it’s not THAT good”. I’ve finally acknowledged that maybe that’s a problem I need to deal with. Along with pricing issues, there come the marketing issues. I’m not good at marketing. It feels somehow a little dirty to me to be promoting myself. Because that’s what it’s ultimately about…. while I may be selling a product, on some levels I’m really selling myself…or at least my abilities, particularly with the jewelry. But I’m going to do it. I’m going to keep plugging away at coming up with a cohesive marketing strategy. Step 1…..this weekend’s craft fair. I’ve made flyers to let people know where to buy my products. I’m not expecting to sell a lot of jewelry because craft fair buyers, here at least, tend to not purchase more expensive items, but I want the jewelry to be seen. Brandy printed me up some business cards on that scrumptious copper card-stock, I bought decorations for the table, so I guess I’m ready to roll. I’ll take pics and post them next week. So we’ll see if I’m getting it right. With the packaging, the marketing, the pricing, the product. With everything. It’ll be interesting, to say the least. As for the pricing, the other phenomenon I’ve noticed is people that drastically over-price their products. But that’s a topic for another blog post. I’m sure I’ll address it at some point. Stir the pot a little. Make a different kind of mess. *evil grin*. I am married to the most patient man on earth. Seriously. Not only is he patient, but he’s all about problem-solving. If I’m going to complain about something, he’s going to look for a solution. And I was. Complaining, that is. 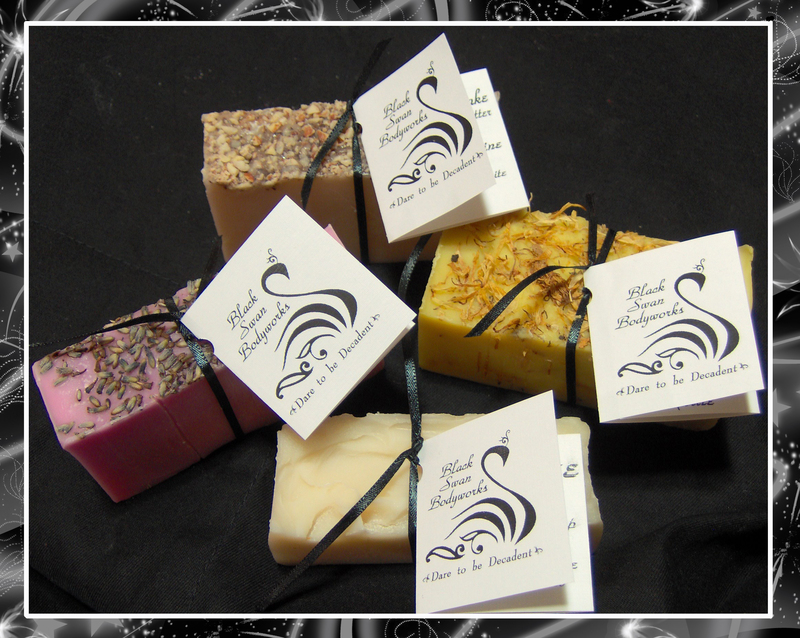 I need packaging or labeling for my soap for this weekend’s craft fair. I’m fussy though. I don’t want the packaging to be fussy. Or cute. Or tacky. Please, oh please, not tacky. Something simple that doesn’t cover up how pretty the soap is. Only one problem: labeling regulations. Here in Canada, there are very strict rules around labeling for cosmetics, which is how soap is classed here. Certain names for ingredients, certain size of fonts, and, of course, the ever-present French-language requirements. Excuse me for a moment while I cuss……#$%^&*()_)(*&^%$#$%^&*(*&^%&**!!!!!!!!!!!!! There’s just so much that needs to be on there. I wanted a simple little square tag in black and white on nice paper with my pretty logo. Unfortunately, this was going to be nowhere near that simple. I knew I needed to add the other info but simply drew a blank on how to go about it. Hubby to the rescue. After letting me yell at him that “I DON’T WANT A BOX!!! !” after he accidentally suggested a box a second time and dealt with my almost-hysterical “it can’t be tacky, country, froofy, frilly, or another stupid piece of paper wrapped around the bar like everyone else”, he struck gold. 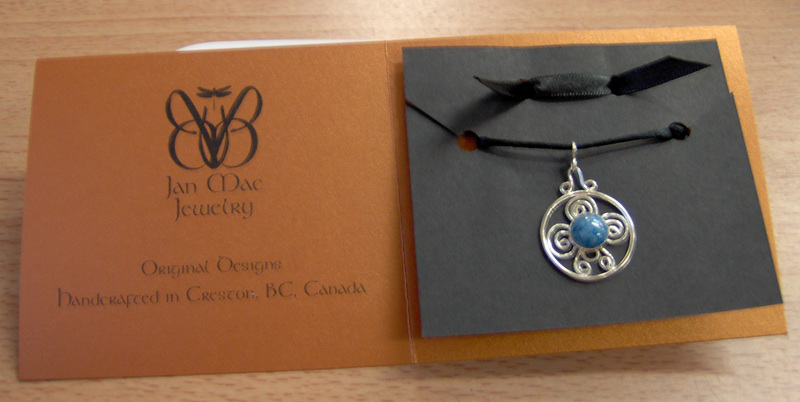 “So make the tag a little fold-out pamphlet”….like the ones that used to come attached to my Murano Glass pendants. Lots of room for everything inside but just what I want showing on the outside. Pure genius. He really is….you know, a genius. My hubby, my hero. Could I just stick my jewelry on the shelf and be done with it? Nooooooooooooooo. Big surprise there. I really wanted something that would showcase the pieces but was unusual, maybe a little stylish. Something that was PRETTY. After the 90’s, I live in fear of anything cutesy, country, lacy, frilly, or, god forbid, Southwestern. I owned a consignment arts & crafts store in the 90’s and lace still gives me hives. The mere sight of a hot-glue gun can land me on the floor in a corner, drooling and twitching. I’m a little phobic….can you tell? My friend Brandy had this amazingly awesome paper. The pictures don’t do it justice but it’s got a pearlescent shine and is the most gorgeous shade of copper. So there you have it. I like how it compliments the pieces but still makes them *pop*. One step closer to them being on the shelves. Now I can build more….Yay!! !